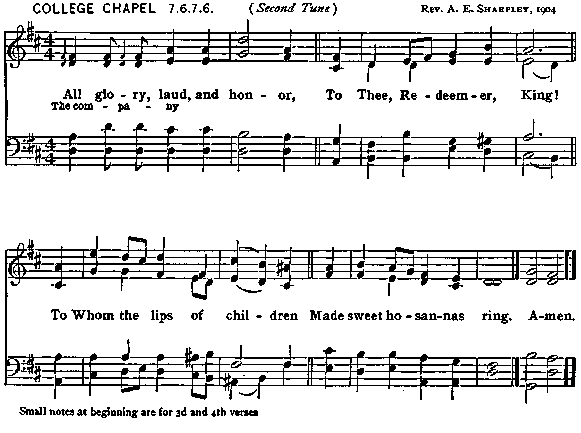 They sang their hymns of praise; To Thee, now high exalted, Our melody we raise. 2 Thou art the King of Israel, Thou David's royal Son, Who in the Lord's name comest, The King and bless&d One. With palms before Thee went; Our praise and prayer and anthems Before Thee we present. Are praising Thee on high, And mortal men, and all things Created, make reply. 6 Thou didst accept their praises; Accept the prayers we bring, Who in all good delightest, Thou good and gracious King.